1) Do not stuff the refrigerator full as it will hinder the flow of cold air thereby decreasing its efficiency. Adequate space will increase the cooling efficiency of the refrigerator. 2) Make sure that the items being kept in the refrigerator are cooled to room temperature before keeping them in it. 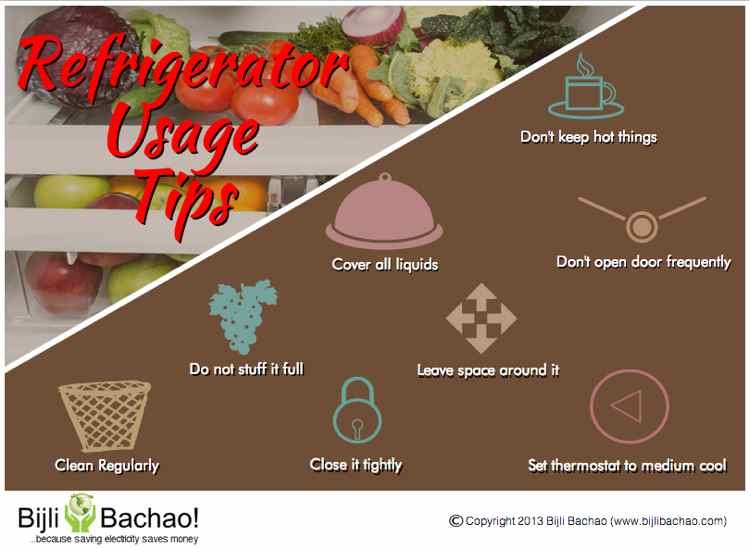 3) Do not open refrigerator door unnecessarily as every time it is opened, some heat enters which decreases its efficiency. Decide what you want before opening the door so that the time for which it is open is less. 4) Set the temperature to medium cool for optimum cooling and lesser electricity bill. High cool will increase electricity consumption significantly (by up to 25%). 5) Always cover any liquids kept in the refrigerator as moisture lost from the liquids can impact condenser performance. 6) Do not let ice accumulate in your refrigerator as it acts as unwanted insulation and decreases the efficiency of the condenser. Defrost the refrigerator regularly to maintain the efficiency. 7) Clean up the refrigerator regularly & make sure that dust does not accumulate on coils (back or bottom) and air intake grill (below the doors). Dust build up can make the motors work harder thereby needing lot more electricity. 8) Make sure that the refrigerator remains tightly closed when not open. Any open space will cause heat to get into the refrigerator causing motor to work harder thereby consuming more electricity. You can make sure that rubber door seals are tight by slipping a paper through it. If the paper slips easily then it needs to be fixed. You can also try keeping a flashlight inside the refrigerator and making sure that the light is not visible from outside. Else seals need to be replaced. Old refrigerators need a lot of maintenance and can consume significant amount of electricity. Upfront investment in buying an efficient refrigerator (BEE 5 Star Rated) can help you save a lot on electricity bill which can help paying back for the upfront investment. But making sure that the refrigerator is used efficiently can help reduce electricity consumption in both old and new refrigerators.